offers users a very simple way to create and publish web sites. Multiple users can collaborate to manage website content as well as add various gadgets into their websites. Google Sites now allows the addition of Google Custom Search as a search option. Login to your Google Site, and select the "Manage Site" option in the "More Actions" dropdown. Select the "Site Layout" option from the Navigation menu on the left. Click the "Configure Search" button. 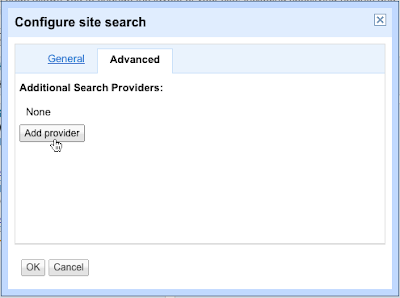 Select the Advanced tab in the "Configure site search" dialog. To add a new search provider, click on the "Add provider" button. Now, we'll need to get information about the Custom Search engine we want to use. Open up another tab or browser window and login to the Custom Search control panel. Find the URL for the search engine you want to use by clicking on it's name in the list called My search engines. Copy this URL; you will use it in the next step. In this example, we'll use the URL for Yoga Search. Go back to the Google Sites search provider dialog. Select "Google Custom Search" as the provider type. Type in the Name, e.g., "Yoga Search" for the search option you'd like your users see on your site, and paste the Custom Search Engine URL that you obtained in the earlier step. Leave the Show results in site option checked. 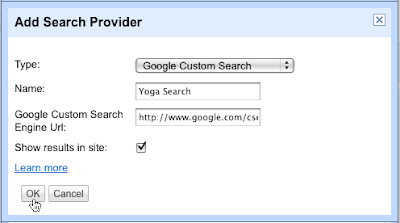 Click OK.
You can change your default provider by clicking on the "General" tab in the "Configure site search" dialog and selecting "Yoga Search". Make sure to Save your settings. You're done. 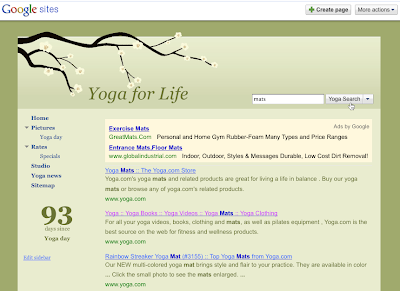 Your users will see Yoga Search as the default search option in the search box on the Yoga for Life website. 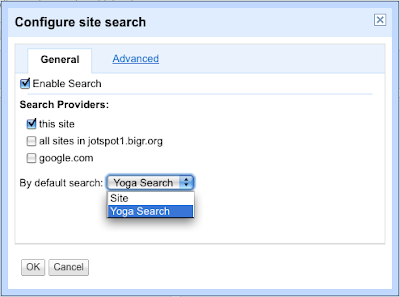 Search, and your results from the Yoga Search Custom Search engine will show up inline, with the look and feel of your site. Try it out for your site, with your own Custom Search engine! As always, we'd love to hear your feedback on new features in the user group. 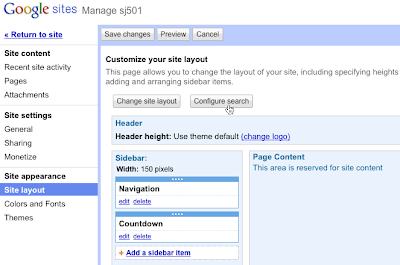 Google Sites offers users a very simple way to create and publish web sites. Multiple users can collaborate to manage website content as well as add various gadgets into their websites. Google Sites now allows the addition of Google Custom Search as a search option.